Flex: Speedstep 80 Regular Flex. Minor dings and nicks on the crown and/or around the edges of the head;. Clubs: 5,6,7,8,9,PW,SW. Normal ball marks and scratching on the face;. Normal scratching on the sole;. CALLAWAY ROGUE CF18 IRONS. Grip:Callaway (Black). Model:ROGUE CF 18. THE GROOVES ARE ALL IN GREAT CONDITION. EX DEMO SET OF. SHAFTS - IN VERY GOOD USED CONDITION - NO RUST OR PIT MARKS ETC. We will always go out of our way to source the product you are looking for. Fitted with Callaway X Series N415 Uniflex Steel Shafts. Callaway X Series N415 Irons. 5 Iron to Sand Wedge (7 Irons). Your parcel will arrive hassle free, quickly and with regular updates. Predict & Follow My Parcel. THIS IS A BUY IT NOW ON A SET OF CALLAWAY XR STEELHEAD IRONS WITH XP95 REGULAR STEEL SHAFTS IRONS. THE SET CONSISTS OF 4 IRON THROUGH TO SW WEDGE. THE SET IS LEFT HANDED. THE IRONS HAVE BEEN USED SO HAVE MARKS ON THE FACE AND SOLES THROUGH GENERAL USE. CALLAWAY X SET OF 6 GOLF SET. THESE GOLF CLUBS ARE ALL L FLEX CLUBS. MID LOW L FLEX. SHAFT SET OF 6. Flex Uniflex Shaft. Callaway X Hot Left Handed Steel Irons 5-AW. Shaft Callaway X Hot. Grip Callaway. Lie 1.0 Degree Upright. Shaft Material Steel. Head: 7 - Good Shaft: 7 - Good Grip: 7 - Good. Model X Hot. CALLAWAY STEELHEAD X14 SAND WEDGE. GOOD CALLAWAY GOLF BIG BERTHA GRIP. CALLAWY GOLF CONSTANT WEIGHT REGULAR FLEX SHAFT. Prototype MB Forged. Left Handed. Golf Traders specialize in all types of golf club repairs. Golf CLUB REPAIRS. We look forward to seeing you at. For more information, call Golf Traders. Shafts - Factory Upgraded, KBS Tour C-Taper 120 Stiff Flex Steel. Irons - 4, 5, 6, 7, 8, 9, Pitching Wedge. The faces and grooves are in good shape and have a lot of great golf remaining. There is a fairly large nick to the 4-iron leading edge and scuffs to the other soles, all pictured. Callaway Apex CF16 Forged. Callaway Rubber Grip. Left Handed. Golf Traders specialize in all types of golf club repairs. Golf CLUB REPAIRS. We look forward to seeing you at. STANMORE NSW. For more information, call Golf Traders. 4-PW Steel Firm Flex Left Handed F4632. RAZR X TOUR. Left Handed. Golf Traders specialize in all types of golf club repairs. Steel Project X 5.5. We look forward to seeing you at. For more information, call Golf Traders. Callaway Big Bertha iron set 5 - PW. Callaway Big Bertha iron set 5-PW steel regular Flex left handed. The bar was so very high. The irons are masterpieces of engineering. Note: Symbolic pictures! The following images show Big Bertha Eisen for right-handed people. 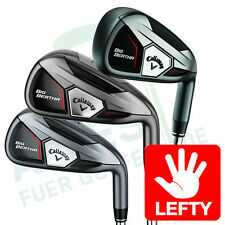 Callaway Big Bertha iron set 4 - PW. Callaway Big Bertha iron set 5-PW steel regular Flex left handed. The bar was so very high. The irons are masterpieces of engineering. Note: Symbolic pictures! The following images show Big Bertha Eisen for right-handed people.